Hello to all the Really Reasonable Ribbon friends and fans. I just love this time of year. Especially since Halloween in just around the corner. You know that 2 months is going to FLY by!!! Today I have made a card to get you into the spirit of Fall and Halloween. I pulled out Deloris (my Silhouette). If any of you follow me at my blog, well then you know all about Deloris! I cut out two circles and attached them together with foam tape. I used a Sharpie and outlined the large circle and added legs. Super easy little spider. His "web" is Bakers Twine in Halloween. I made the fun bow on the front of the card using 3 different Really Reasonable Ribbons and black lace. The base of my bow is Plaid Ribbon in Orange with Black Stitching. Then I added Sheer Ribbon with 4 Thin Satin Stripes in Black. Finally the last part of my bow is a tripple loop of 3/8" Gingham Orange. Once I tied my bow I added it on top of Glady's Black Crochet Lace. This is not the last of these fun little spiders. I plan on doing a few more layouts before Halloween. Maybe even a quick tutorial! Thanks for stopping by! Happy Hump Day! Enjoy the rest of your week. 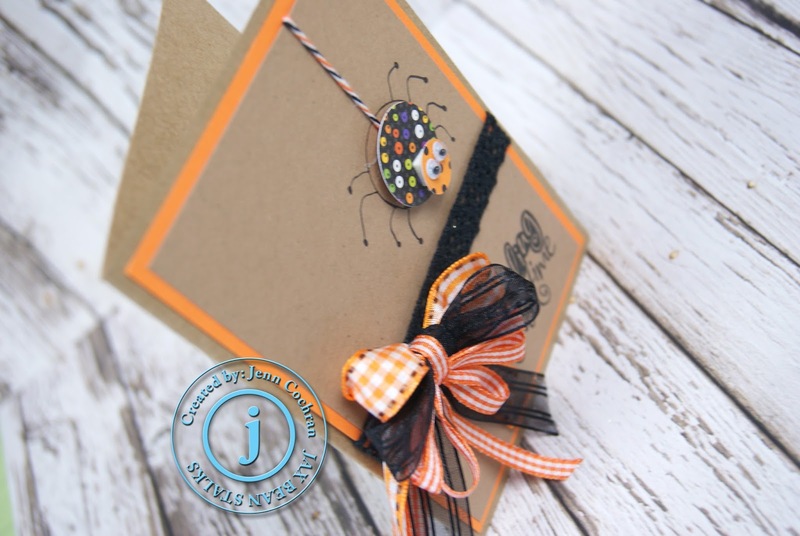 Love this card...beautiful ribbon and the spider is adorable. Yes, do a tutorial!